I love reading magazines when I have the time. It could be a home interior magazine, a pregnancy magazine or a gossip magazine. However looking after a toddler does make it hard to find the time to read, let alone get a physical printed magazine in my hands. So we were excited when Readly invited us to review their online magazine subscription service and to run a competition on my blog. If you haven’t heard of Readly, it’s an online magazine subscription service where you pay monthly, download the App to your Android or iPhone, and this instantly gives you access to 2,600 magazine titles at your fingertips. There are 69,200 issues available in the app for you to view online or to download allowing you to view offline. In fact there are so many titles that there is bound to be something for you. You could be a travel lover, a property mogul, a teek geek, a food lover, a pregnant mum, a motor head or a gossip hunter. Whatever magazines you love reading, Readly will have something to suit you or your favourite titles including GQ, Hello, Marie Claire, Cosmospolitan, Good Food and Gurgle. We loved using our Readly subscription, and I really enjoyed browsing through all the Mother and Baby magazines before bed on my phone or iPad. It definitely made a change from procrastinating on Facebook and Twitter. I also couldn’t believe how easy it is to use. It is so easy to set up, and it is very quick to search for titles and have your favourite magazine on your phone in a matter of seconds. 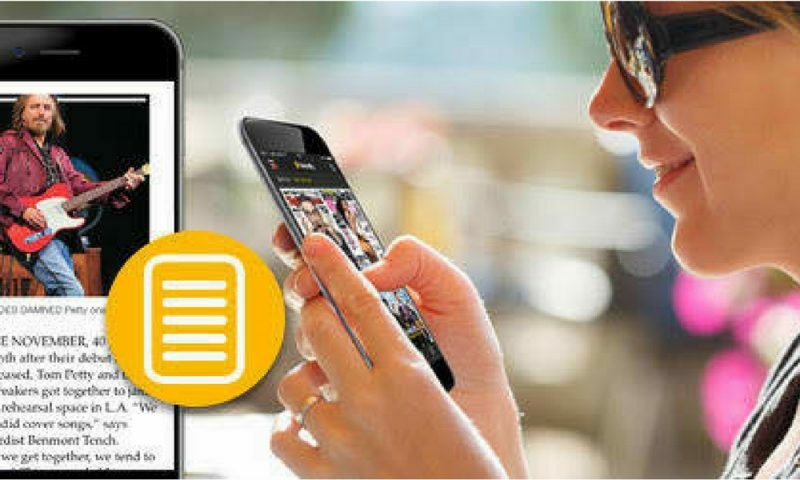 All magazines are optimised for smartphones, so there is no need to aimlessly scroll around the page to find the relevant content. Often I would take magazines on holiday or purchase them at the airport. The Readly App is ideal for this purpose taking away the need for carrying magazines around with you. 1 in 5 people would use Readly on the beach, and I can imagine myself being one of those people. It also would mean that I could easily browse to articles I wanted to read, rather than having to purchase a magazine and not read half of it. Plus think of the environment and trees that you are saving by using an App instead. Another plus point of Readly is that it makes the commute or travelling to work a lot more enjoyable. There is no need to carry magazines around with you, and you will always have a magazine at your fingertips to read. Sometimes I wish I was still a commuter heading into Central London, just so I could get some time to browse through the huge range of magazines on my phone. What’s also great about Readly is that it allows you to use the app across 5 different devices, with 5 different user profiles. This makes it perfect for family use, allowing everyone to view magazines of their choice on their own device. Readly costs just £7.99 per month which is about the price of 2 magazines, however you have instead access to 2,600 title at your fingertips. So you are definitely getting your money’s worth. To access the content all you need to do is sign-up online, and the download the App. If you’re planning a trip abroad and worried about your data usage, fear not. All Readly titles are available to download, allowing you to download these before you jet off on holiday. 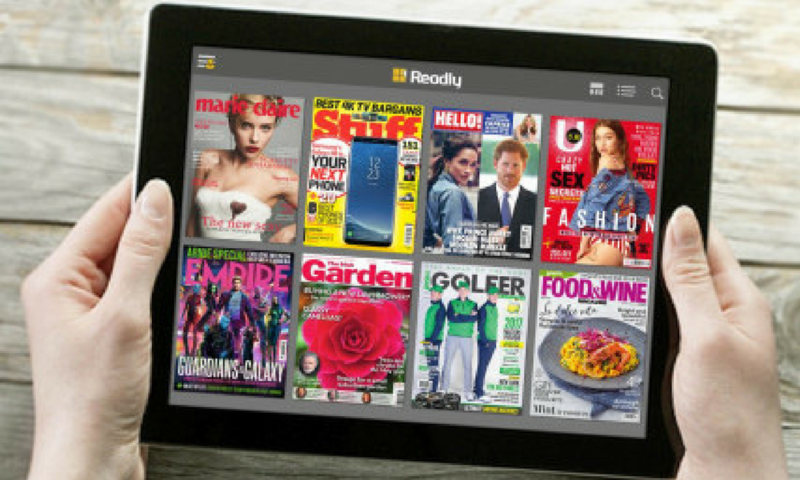 For more information about Readly, how you can access it and what magazine titles are available, then head on over to their website. 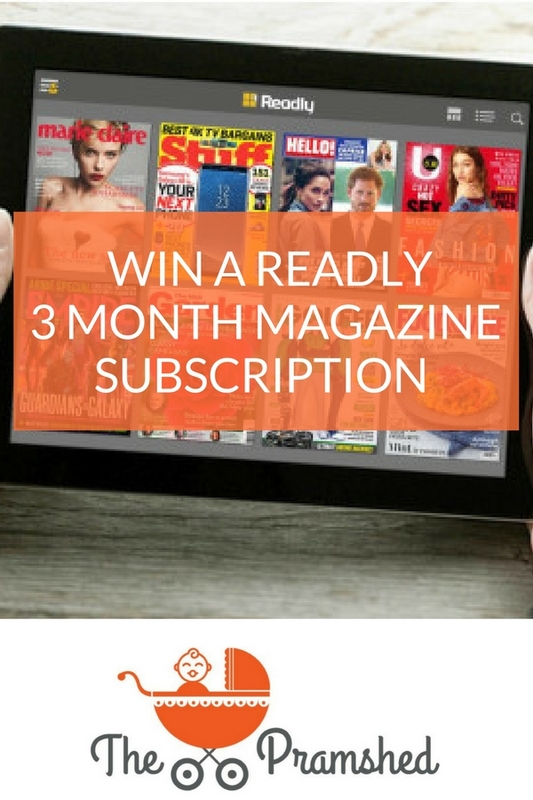 If you fancy getting your hands on a Readly magazine subscription I’m offering two of my lucky readers the chance to win a 3 month subscription to Readly. It’s really easy to enter, all you need to do is enter via the Gleam competition mechanic below. The competition is open daily until Friday 11th May. Good Luck! The competition opens on Friday 27th April and ends at 11.59pm on Friday 11th May. Entries that are incomplete, illegible, indecipherable, duplicated or which contain profanity will not be valid and deemed void. To enter applicants can do the following: 1) Comment on the blog post, 2) Visit Readly and/or The Pramshed on Facebook, 3) Follow Readly and/or The Pramshed on Twitter, 4) Retweet a tweet, 5) Visit Readly and/or The Pramshed on Twitter, 6) Visit the Readly website. Any partial entries will be disqualified. The prize is as stated and comprises of 1x 3 month subscription to Readly. This prize will be allocated to 2 winners. The prize is not transferable to another individual and no cash or other alternatives will be offered. The winner will be announced Saturday 12th May 2018. Unless stated otherwise the winner will be drawn at random from all correct entries received by the closing date 11th May 2018. This is a collaborative post with Readly. To be able to read some of my favourite magazines. I rarely read magazines now, I like my kindle and the ability to make the text as big as I like that day, and it’s so much easier to hold. So would be great to try some on my lovely kindle. Fantastic giveaway hun. I miss my subscriptions so much! This sounds fabulous! Magazines are such paper waste nowadays. If you could have them all at your fingertips, that would be ideal! Switching to a good read instead of social media before bed sounds like a great idea! Great way to catch up on so many magazines. Very good value considering how expensive they can be. I’d love to win as I LOVE magazine content but so rarely get around to treating myself to them! I soooo don’t have time to read magazines! I wish I did. Maybe it would be easier with Readly (must admit I’d never heard of them before now). Would be nice to have up to date information, photos, fashion via magazine (online). I’d love to trial it to see how digital copies of my fave mags compare to a print copy. If you buy more than 2 a month it’s a no brainer. I love reading a magazine while enjoying a cup of tea. I love that readly has children’s magazines too. Such a vast range of magazine available :- The prize would help me with life long learning. Variety means great range of topics to choose from. I would like Readly because I love entering competitions and I bet there are plenty in these magazines! Thanks for the chance to win! because I love to read magazines and get all the latest gossip!